Trade unions, populist activists and many Democratic lawmakers are rallying against the Trans-Pacific Partnership (TPP) trade deal. They say the secretive treaty is harmful to US workers, the economy and environmental policies. Social justice activists from more than 30 states marched in downtown Washington, DC, on Monday, chanting “This is what hypocrisy looks like!” and carrying signs such as “Dump TPP: Don’t trade away our future.” They called on Congress to vote against giving President Barack Obama the authority to 'fast-track' the treaty. Proponents claim the TPP, the largest trade deal since the 1994 North American Free Trade Agreement (NAFTA), would open up Asian markets to US exports. Critics allege that much of the trade pact was written by and for corporate lobbyists, who would reap any benefits while leaving the workers and taxpayers to shoulder all the expenses. Only five of TPP’s 29 chapters are about trade, while others focus on patent protection, financial deregulation, internet privacy restrictions and litigation. “It is absurd that a trade agreement of such enormous consequence has had so little transparency,” said Senator Bernie Sanders, a Vermont independent and keynote speaker at Monday’s protest. He also warned that the TPP would give foreign corporations the right to challenge US laws in special courts, endangering public health and environmental initiatives. 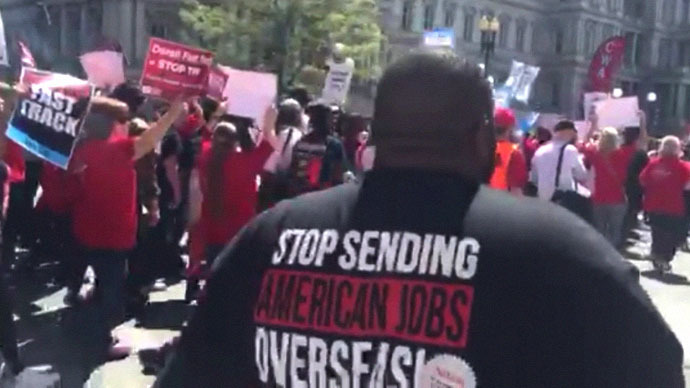 Monday’s protest was part of a week-long push by the trade union bloc AFL-CIO to oppose the Trade Promotion Authority proposal that, if passed, would enable the White House to negotiate the TPP without giving lawmakers a chance to amend the deal. AFL-CIO submitted over 200 suggested changes to the draft of the treaty, Trumka said, but only four or five have made it to the negotiating table. To block the fast-track authority, the AFL-CIO's political action committees (PACs) recently stopped all donations to Congressional campaigns. The potential loss of US jobs is another hot-button issue for labor unions and lawmakers alike. “One of the key reasons why the middle class in America continues to decline and the gap between the very rich and everyone else is growing wider is because of disastrous trade agreements which have sent millions of decent-paying jobs to China and other low-wage countries,” Sanders said. It isn’t just the unions and independents bucking the White House lead on the TPP. Last week, top Democratic lawmakers spoke out against the trade pact at a protest outside the Capitol. Yet the lawmakers did not name President Obama in their criticism, as that would have caused “cognitive dissonance” among the assembled Democrats, Grayson told Washington Post columnist Dana Milbank. The Obama administration has been anxious to finalize the TPP, what with China pushing an alternative trade agreement and a number of traditional US allies agreeing to join Beijing’s new Asian Infrastructure Investment Bank. The countries currently negotiating the TPP with the US are Australia, Brunei, Canada, Chile, Japan, Malaysia, Mexico, New Zealand, Peru, Singapore and Vietnam.